Well, I decided to go with the Paul McCartney look, although I do fancy the idea of putting the Lennon glasses onto another doll. 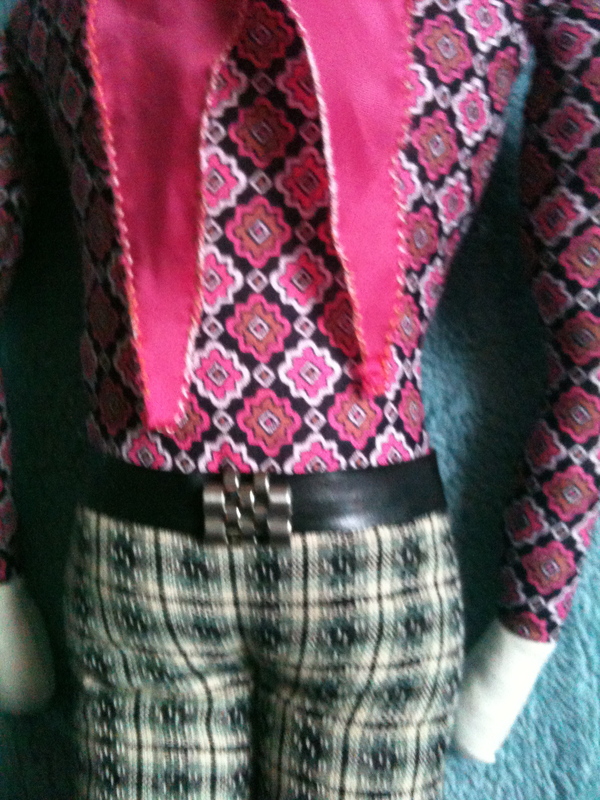 This doll has a nice brown early Laura Ashley print shirt and has that sixties Carnaby Street look. He has Chelsea boots and tight hipster trousers and a silk scarf and a fur jerkin. I half wanted to make him an afghan coat, but to be honest it almost took longer to make and fit that jerkin than it did to make the doll. He is a funny shape. I spent ages making a toile and then found myself stitching amid a ridiculous amount of bits of fur fabric which shed from the cut edges. I have really enjoyed making these male dolls and giving them faces. I have experimented a bit with Keith here and given him rosebud lips and the suggestion of longer hair. I like making the dolls but the real fun is in giving them accessories. Keith, by the way, is named after people who had a great time in the sixties and early seventies: Keith Moon, Keith Richards and the Medieval Historian’s disreputable friend, Keith, who seems to have had a whale of a time all round. He’s called Simon after Simon Dee and Simon Templar. It was such a smart name for a while in the late sixties and early seventies. I am aiming to make a consort for all the Laura Ashley dolls, probably with LA fabric shirts. I couldn’t resist buying a remnant of fur fabric to make an Afghan for one of them. I am rather hoping this frenzy passes quickly. I was talking to Janet, a felt maker friend, today and she was saying that you might as well just give in and wait for the frenzy to pass. The problem is that I can make one of these in an evening. The hair dries overnight and then they are done. So it is really quick to make a doll if I have an idea and this just seems to fuel the desire to make them rather than assuage it. 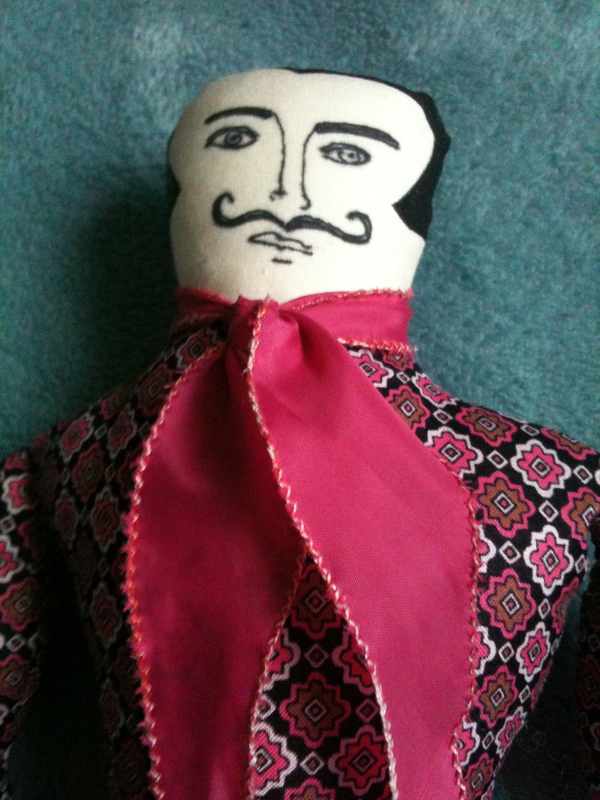 So, I will keep my obsession to myself concerning the Mr Laura dolls, and maybe have a grand unveiling at the end. I had a couple of gos at his hairy chest. I tried colonial knots but they just looked like he had a nasty skin disease, and I tried little ties of stranded embroidery cotton, but they looked clumpy like a different skin condition and so, in the end, I fell back on free machine embroidery over some black net to fill in the gaps. Quite quick to do and a nice effect. The cotton fabric for his body was a remnant so I have no idea of the make, but gave him that toasty tan colour of a lot of peacock males, and the lovely green fabric for the kaftan, which I thought was just right is a Kaffe Fassett print which I bought in a sale in Bristol because I couldn’t resist it. Then it make the perfect fabric for Maurice’s kaftan with a good match of scale. I am slightly troubled that I appear to be falling in love with these boys, and what that says about the state of my psyche, but they are really good fun to make. The Medieval Historian rather likes them as well, which helps. Maurice seems even more pleased with himself than Gorgeous George. I think it might be the moustache. I have another piece underway where there is no moustache (but a rather nice Laura Ashley shirt) and he looks a lot less smug. I think Maurice’s love affair with himself is infectious, though, he makes me smile whenever I catch sight of him. I bought it because I wanted to find out about doll makers and what they think about their craft. There seems to be a trend for these new craft books with some bios and projects and commentaries. I would, as a academic, like a bit more in-depth and extended interviewing, but I appreciate that I am in the minority. Anyway, this book is a delight, not least because the pattern in the back are full size and so there are no clandestine trips to the photocopier. I thought the construction method of the tatooed man in the book with his legs formed by a line of stitching looked interesting and couldn’t wait to get started. Of course, I had to wait, because it was a working day. So I didn’t start until eight o’clock and I finished at eleven which isn’t bad for making a doll from scratch including producing the templates. The problem was that I then couldn’t sleep because my mind was racing with ideas for other dolls. First I want to make some husband dolls to go with the Laura Ashley ghost dolls. Several people have asked me about them and I think that I now have a way of creating them. I might make the doll a bit bigger or not, but I rather like the idea of giving them Laura Ashley shirts. There is nothing scholarly about this; I just think it would be fun. Second, making these dolls does have one scholarly application. It allows me to think about making and the joy of making. I have always been interested in the work of Mihaly Csikszentmihalyi, a life-long theorist of happiness and creativiy. I have mentioned him before. He was the populariser of the notion of flow and being in the flow. He says that this state can lead to happiness. It happens when you are working on a task which is just difficult enough for you to have to concentrate but not so hard that it provokes anxiety. When you are in flow you experience a kind of one-ness with the task and the world, you finish it with more energy than you started (hence, possibly, not being able to sleep) and you have no idea how long you have been in it. Time seems to stand still in flow, so you don’t know if you have been working on your doll, say, for an hour or three hours or thirty minutes. I experienced all this. It is a blissful state for me. And I also experienced that state where you have the exact things you need to hand. In this case some seventies fabric with a very small print that my mother gave me which became his shirt, a scrap of curtain lining which became his skin, a length of the sort of plastic stuff that they put in strapless frocks to hold them up which I used for his belt and which looked a bit like leather, and a piece of broken jewellery which made a wonderful belt buckle. Almost all this stuff, come to think of it, apart from his trousers and scarf, came from my mother and would have been in landfill if I hadn’t used it. But everything was to hand and worked beautifully. I used to be interested in how you could think about flow and creativity and motivation. If people experienced flow in their paid work as opposed to their hobbies and recreations (Csikszentmihalyi says the most common form is reading) then , I thought, people would be motivated at work and happier and possibly more productive. Now I am just a critic rather than a contributor my focus has shifted! But, I do want to write about the sheer fun and delight in making George. It was just delightful – full of delights – no other word for it, to put him together. 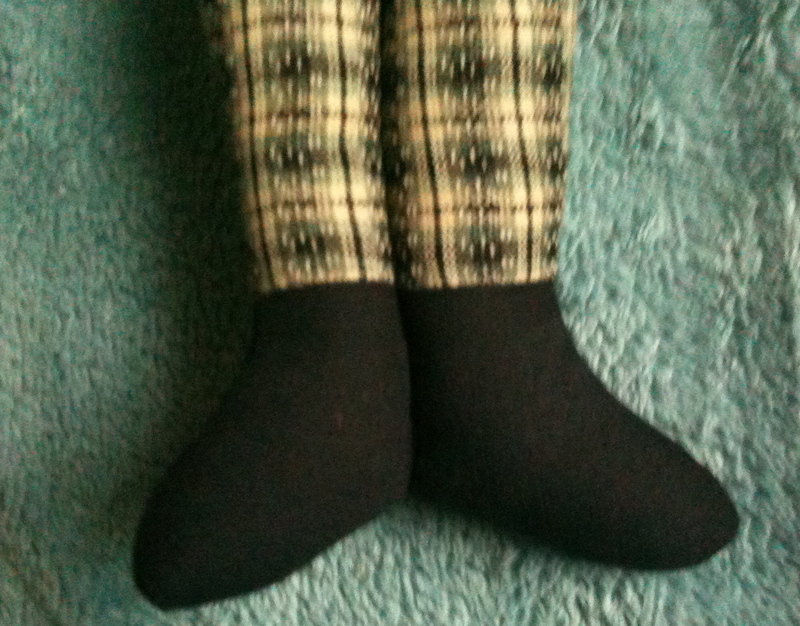 To see his toes turn out when I stuffed him, and to see him emerge with his character as I chose the fabrics. He became a seventies hipster quite early on, but the scarf, which was my flourish at the end and the sideburns rather sealed his fate. I know a very excellent doll maker called Joan who says that the doll’s personalities emerge as she makes them and that she doesn’t know what they will be like until she starts to stuff them and sculpt their faces. I think this is quite common. The doll tells its own story – which is likely to be the subject of a later post. And I couldn’t get rid of Carly Simon singing ‘You’re so vain’ in my ear. I really wanted to give him an apricot scarf (You walked into the party/Like you were walking onto a yacht/Your hat strategically dipped below one eye/Your scarf it was apricot), but the pink was the best I could do. I would do his arms differently if I made him again. He is quite muscle-y, and I would make them thinner and attach them more naturalistically, but all in all Gorgeous George is a bit irresistible, and even the Medieval Historian laughed spontaneously when he saw him.